Have no fear, the 99 are here! After 9/11, Kuwait-born Naif Al-Mutawa realized that this world needs some Muslim superheroes. And thus, the 99 were born. The 99 were created to be the next Supermans, Batmans and Spidermans idolized by the young and old, and served to teach the ethics of Islam to people around the world who may only see the bad in Islam during this war against terrorism. More importantly, they are meant to remind Muslim children of the core values in Islam and to not be influenced by the extremists who too, like Anwar-Al Alaki and the “Intifada Album” use more contemporary means to reach out to a younger audience of Muslims. The 99 Comic book characters personify the 99 moral attributes of God, ranging from being peaceful, to being patient, to being just. This is where the backlash from the Muslim world toward the 99 comic book series stems from. In Islam, it is forbidden to humanize Allah, and more specifically to draw him. This is why the Dutch portrayal of our Prophet Muhammad drew protests around the Muslim world. Many interpret the “99” superheroes as being 99 parts of God. Despite backlash from the religious right and Saudi Arabia (who still refuses to allow the 99 to be sold in their country), the 99 has become surprisingly successful in the Middle East. Muslims around the world have embraced this redefinition of Islam through comics because they see it as a positive, and rightful portrayal of the Islam they believe in. Al-Matawa has over and over again emphasized that the 99 superhero characters are not humanizing Allah, but instead, are emulating his attributes. 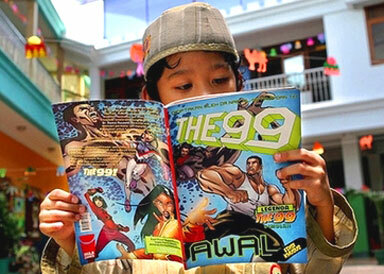 The characters of the 99 are some of the most modest superheroes that will probably ever hit the comic industry. They’ve abandoned the spandex, the one piece armor and muscle revealing clothing. Instead they adore loose-fitting moderate clothing. Many see the comic as being too “Western”, because not all the women wear a veil or hijab, and the fact that it is a comic, which are typically created in the United States. However, the 99 initially did not have an overwhelmingly popular introduction in the States. As LoonWatch explains, any saw the 99 as being an attempt to indoctrinate American children with Islam– anti Muslim blogger Andrea Peyser called to “cancel the 99 before it starts” which was featured in the New York Times (although the NY Times also had plenty of good thingsto say about the 99). Many feared that it was the start of imposing Sharia Law in the United States, as well as an attempt to “masquerade the bad guys”–the big bad scary Muslims. Naif Al-Matawa, creator of the "99"
This wouldn’t be the first time a comic book “indoctrinated” its readers with a religion. In Fact, the all-American classic Archie Comic books was published by Spire Christian Comics in hopes of instilling Christian values in American children. The 99 were created for the same purpose, but that can’t be considered parallel to “indoctrination”, especially of Sharia Law. These Muslim values are very similar to these Christian values which teach children to be moralistic, and modest. That doesn’t have to be a religious thought, but an ethical one. It’s definitely not one portrayed in the contemporary entertainment industry. The 99 Comic starts in Baghdad during the mid 13th century during the Mongol invasions. The Mongols throw all the books into the river, essentially trying to erase the history of the Arab People (disclaimer: true history). However, some book keepers escape the massacre from the main library and throw 99 pieces of “Noor” (which means “light” in Arabic) stones into the river which absorb the knowledge of the books in the river. Throughout the centuries the Noor stones have been dispersed throughout the world. It is when these youth find the Noor stones one by one do they adopt super powers. Similar to X-Men, these youth are pulled together by adult-figure Nawaf al-Bilali, who creates a 99 Justice-League esque team to save the world from injustice. Speaking of the Justice League, despite intiial setbacks in the United States, 99 and JLA (Justice League of America) have teamed up in 2010 to produce 6 comic books with the 99 and Justice League working together to save the world. (Admittedly, that’s how I discovered the 99; huge DC fan). Aside from picking up a copy of JLA/99 #1 in a nearby comic store (which I plan to pick up my next copy sometime this week), I became interested in the 99 after watching the documentary, “Reel Bad Arabs” (watch the full documentary here)about how Hollywood vilifies a people. It’s comic books like 99 that will set the record straight, and prove stereotypes on Muslims and Islam wrong. The 99 are not only superheroes for Muslim children around the world, but are becoming heroes for Americans, who see hope through these characters that the Muslim World too has a stake in the war against terror. ← The best solution to stop harassment of women is not to wear a burqa–It’s for men to stop harassing women. To put it simply.